One of WorldNetDaily's favorite pastimes of the Obama presidency is to liken him to Hitler and various other Nazis. It even had a former Hitler Youth, Hilmar von Campe, repeatedly push the slanderous attack, demonstrating he hadn't completely renounced Nazi propaganda techniques. Barack Obama’s first presidential campaign, with its messianic characterizations – the photographs in which a halo was cast around his head, the worship-like adulation from crowds – gave Holocaust survivor Anita Dittman nightmares. 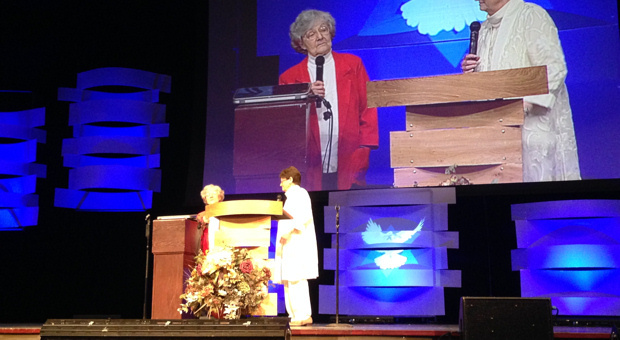 The petite 86-year-old over the weekend told a riveted audience at Olive Tree Ministry’s “Understanding the Times” conference it’s because she sees clear parallels between Nazi Germany and present-day America. A young girl in Germany when Hitler came to power, Dittman said her experiences amplified the alarm she felt. Dittman said her nightmares were triggered by the left’s gushing adoration of Obama as a perceived savior. Establishment media were equally enamored with Obama and failed to vet him to the American public, as most famously exemplified by MSNBC’s Chris Matthews, who described experiencing a “thrill up (his) leg” when he heard the then-candidate speak. The media’s infatuation helped cultivate the atmosphere that ushered Obama into the most powerful office on earth. Establishment media reporters didn’t question his qualifications or competencies; conservative news outlets that investigated his birth certificate were openly mocked. Media also never asked him hard questions about his disturbing history of close associations with communists and terrorists that included Frank Marshall Davis, Bill Ayers and Bernardine Dohrn, she said. Liberals’ blind idolization of Obama mirrored Germany’s hypnotic fascination with Hitler, Dittman said of the racist tyrant whose vitriolic rhetoric dehumanized the Jewish people as a prelude to his attempts at total annihilation. Obama’s empty rhetoric that energized his followers chilled Dittman, who compared it to lies peddled in Germany painting promises of a bright future. A 20-minute preview of the film, which was produced by WND founder, Editor and CEO Joseph Farah and directed by WND Films Vice President George Escobar, premiered at the conference where Dittman revealed her concerns for America. See? WND has learned how to profit off libelous smears.